SPACE STATION NATHAN: Meet the Spy! We interrupt the grey landscapes to bring you...another Hazardous Tales narrator intro! That's all three narrators! You can see the full set at www.hazardoustales.com. Sales with these books are different than my others have been. I've never worked in the non-fiction/educational market before (not as an author anyway.) All of my previous books have been very commercial. Fantasy/fairy tales/fiction--sure there's aspects of learning in those books, but not like these. The publisher and I are very curious to see where these get shelved. Yes, they are non-fiction, but they are cartoon non-fiction, with a thick layer of joke frosting. Me, I'd shelve them with the graphic novels. In any case, it will be fun to see how it goes with these books. If you haven't seen them, you should check them out, get your library to order them. And if you have read them, tell a friend or post a review online. These little books are odd ducks, they are cool ducks and they are funny ducks, but they really are odd ducks--word of mouth will really help them swim. We now return to the grey landscapes. I'm really enjoying them. When I ordered them for our library, I had put them in the JNonFiction category, but our Tech Services (Catalog) department moved them into JFiction. We don't have a separate graphic novel collection, so that wouldn't have worked. I haven't gotten to read them yet because they've been checked out :D but I'm looking forward to it! 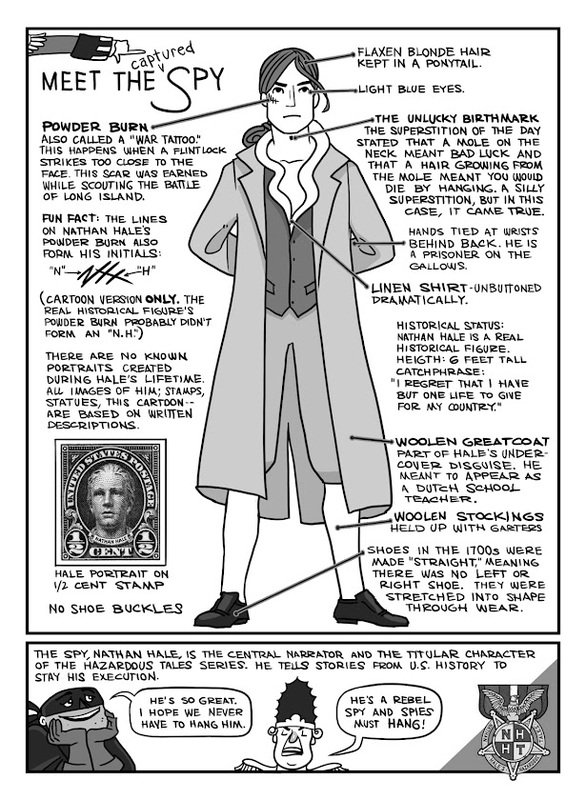 Tell you what, that Nathan Hale is a cutie! Flaxen blond hair, light blue eyes. Hmm . . . sounds familiar. I definitely see a big future for historical graphic novels. Reading history should be fun! Shoot! Strike 3=I am a robot!